At 850m above sea level, Alpendorf is just south of the city of Salzburg and in the ski season is very popular with local Austrians, as well as German, Danish and Dutch skiiers. The village itself is a part of the larger town of St. Johann im Pongau, which is dominated by a rather glorious cathedral. Some of the best places to stay in Alpendorf offer cathedral as well as beautiful alpine views. Alpendorf has a good reputation for snow, and is linked to the Ski Amade, a network of connected ski resorts with around 870 slopes between them. You can walk to Alpendorf’s own lifts and runs from many of the village’s hotels, and there are around 350kms worth of runs of its own - most of them red and blue - plus around 220kms work of cross county skiing trails. Explore the magnificent Cathedral in Alpendorf, it's hard to miss! The winter ski season! Alpendorf has 350 km of its own piste! Its popular with the locals too - always a good sign! Don't forget that the best places to stay in Alpendorf will be incredibly busy during the peak ski season, so if you're planning to visit in winter, book well ahead. 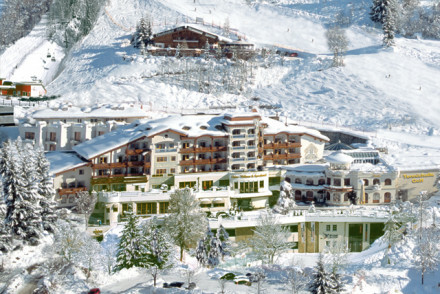 The Alpina Hotel is an imposing hotel set right next to the lifts. The overall effect here is of elegance; the reception is sleek in marble and wood, and there are two restaurants and a spa. There’s also a cosy bar and library. An ideal hotel for all the family. The closest airports to Alpendorf are Salzburg (1 hour away) and Munich (2.5 hours away). Alpendorf is primarily great for all snowsports in the winter, while in the summer hiking, cycling, and mountain biking are very popular. Elegant and imposing hotel right next to the gondola. Sleek reception in marble and wood with adjacent bar, cosy library with crackling fire, spa, two restaurants and numerous activities on offer. A classy establishment that caters to families and couples.